My Mount Kenya Experience - "The Independence"
Climbing Mount Kenya had been in my bucket list just like Mount Kilimanjaro. What is most interesting is that Rotary turned me to a mountain climber. And more fulfilling because I was doing it for Charity. 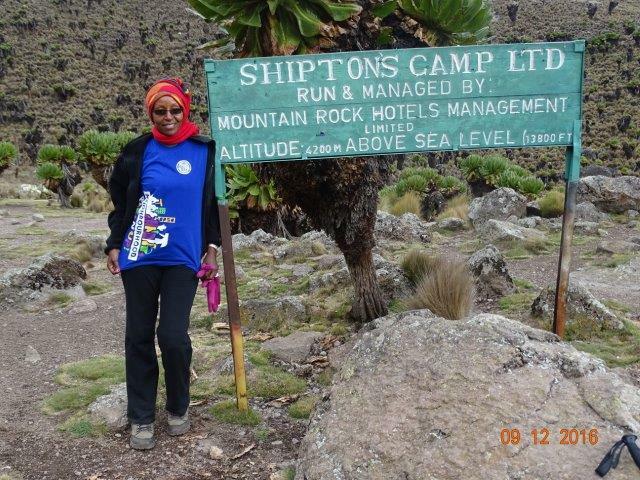 I climbed Mount Kilimanjaro in 2015 and stocked a library in a rural school with books from class one to eight. Training began in August 2016 and we climbed Mount. 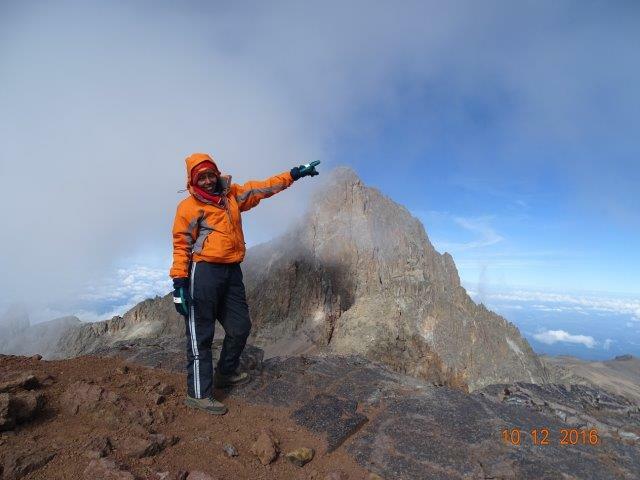 Longonot (2895m) asl, Mount. Kilimambogo (2570m asl), Ngong Hills, Aberdare Ranges (Elephant Hill) (3,905 m asl) plus other countless walks at serene Karura forest and Arboretum. The weekends were mostly taken and my friends once again nick named me “Miss Kenya-Rotary chapter”! This time was easier because most of us now had the experience and knew what to do. We set off for Mount Kenya on 8th December 2016 after breakfast; this was a 3 hours road drive from Nairobi to Nanyuki. We arrived at the Sirimon gate (2650m asl) at 1.00pm where we had lunch and began to ascend at 2.00pm. After a 9 kms walk, we arrived at Old Moses camp (3300m) at 5.00pm for the night. The night at the bankers was manageable. We set off the next day at 8.30am for Shiptons camp (4200m) and after 14kms, we finally arrived Shiptons camp (4200m). Day one and a bit of day two were manageable and all the six (6) of us were at ease and greatly enjoyed the walk and fresh air. The two days saw us go through forest and moorland types of vegetation with lots of giant lobelia. 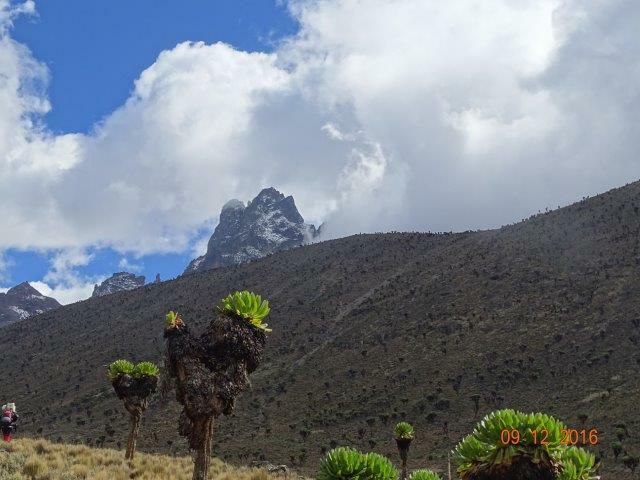 The beautiful Batian which stands at 5199m asl and is the highest point, was visible throughout. We walked along and crossed extremely beautiful Liki and Mackinders valleys and enjoyed lunch at Ontulili river. The last stretch towards Shiptons camp was quite a sharp ascent that saw some of us struggle a little bit. We layered up; some of us putting as many as six layers from two sets of thermal wear, warm tops, fleece jacket and the waterproof jacket. We slept and woke up at 2.00am for light tea and some biscuits. The temperatures at this time were below zero, was pitch dark and the sky was crystal clear. We set off at 3.25am in a single file and all we could see were our head lumps. The ascend was quite steep and the ground had many stones and loose gravel. The walk was pretty difficult as we battled with altitude amidst the many falls from the sliding loose rocks. We frequently begged for breathing and water breaks. We totally lost count of time and seemed as if we had been walking forever until day break. Indeed, it was a beautiful sunrise that brought smiles and hope to all of us as we watched sun ray’s reflection on Point Nelion. One word to describe most of us… dead! We were hungry with frozen fingers and toes! This was now seven in the morning and we had to push on to Lenana point through cliffs and rock climbing with a lot of help from the patient guides. From this point Lake Michaelson and Ellis were visible plus many other tarns and peaks that characterize Mount Kenya. After five hours of treacherous walk and rock climbing, point Lenana was right there looking all very graceful with beautiful views including a glacier. And yes! We suddenly got a burst of energy and dashed to stand at the third highest peak of the second highest mountain in Africa stranding at 4985m asl. The sun was out and this helped warm us up. We spent some minutes there taking pictures and grateful as this is the point where the Kenya flag was hoisted when we got our independence on 12th December 1963 and it is the source of Tana river. 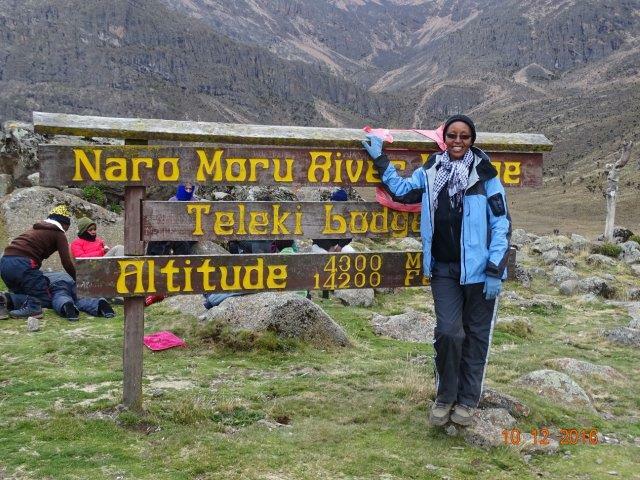 We used the Naromoru route to descended and walked to Mackinders camp (4200m asl), 11kms from Lenana point where we had brunch. This was a difficult rapid descent through Austrian Hut that had a long, loose and uncompromising scree slope up the side of the Teleki Valley. From Mackinders to Met Station (3000m asl) was damp bog that slowed us down and was taxing. We finally arrived at Met Station at 7.30pm, which made our total walking hours to about 16 hours. We left the park and went to spend at the Ol Pajeta game reserve. 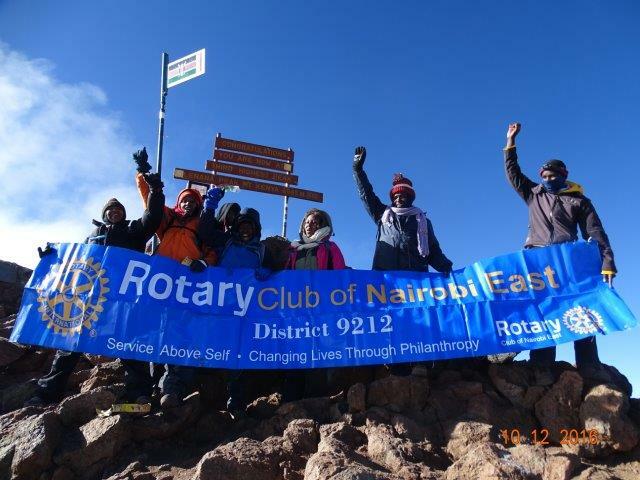 Rotarians are special as they had a home coming party for us and we narrated our Mount Kenya experience. We finally made it to bed at 3am, which means that we had been awake for 25 hours. 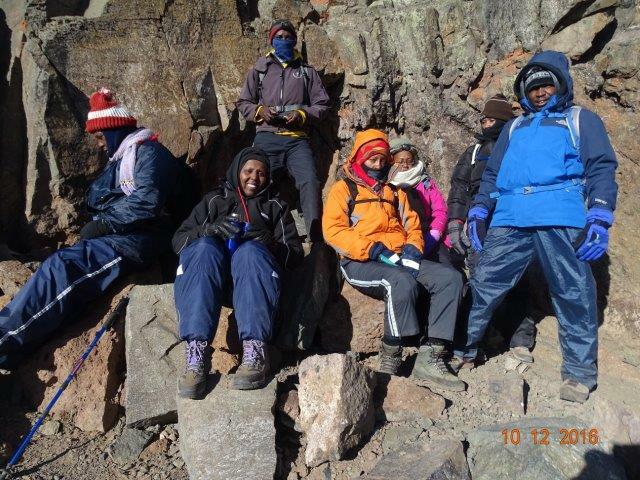 Indeed, we conquered Mount Kenya! And all for Rotary! Lessons learned from the climb were many. First, was the goal setting and determination to implement and achieve those goals. Another lesson leaned was also the discipline and consistency required in life and hard work in order to meet our objectives as well as preparedness and planning. Our training involved the frequent practices, eating well, drinking lots of water and getting the right gear in readiness for the climb. My other important lesson was how easy life is when one takes the situation in its simplicity. We did not take any showers for the two and a half days and small rooms (burning bush/rock) were in the open during the day and we all did not mind each other. This created a special bond among us and lifelong friendships.